The card was printed, by the firm of J. WALCH & SON, without any stamp imprint, with the idea of encouraging the government to issue "Official Postal Stationery". This card was printed and sold in 1882 and later, in the same year, the government did issue official postal stationery. Thus, this card is a precursor to the official postal stationery and while it did not have a pre-printed stamp, the price of mailing was so indicated in the upper right corner--2d INLAND POSTAGE & 1d TOWN POSTAGE. LOCAL or REGIONAL mail even though the rates were different. This card measures 78mm x 118mm and is printed in red. 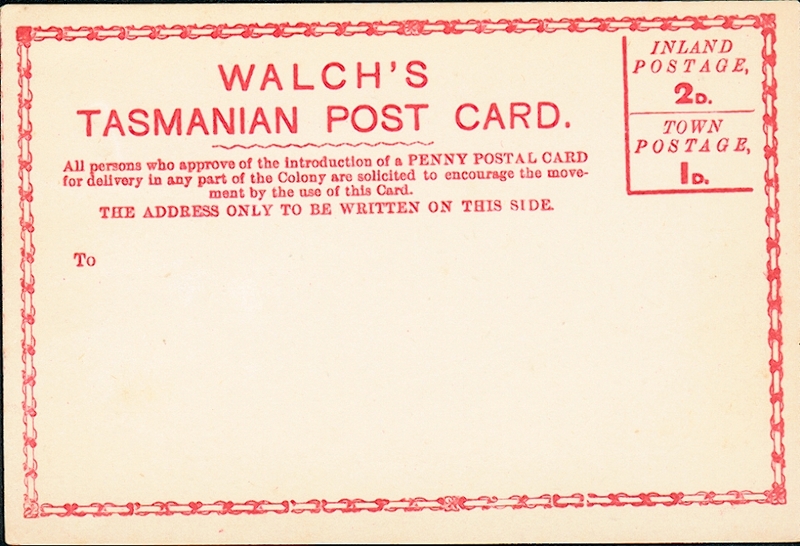 Printed on the card is "WALCH'S TASMANIAN POST CARD" plus the postal rates (upper right corner) and the direction that "THE ADDRESS ONLY TO BE WRITTEN ON THIS SIDE". But, in addition, there is the following encouraging statement "ALL PERSONS WHO APPROVE OF THE INTRODUCTION OF A PENNY POSTAL CARD FOR DELIVERY IN ANY PART OF THE COLONY ARE SOLICITED TO ENCOURAGE THE MOVEMENT BY THE USE OF THIS CARD". This notion apparently worked since the official postal stationery was issued later in the same year. A little bit of AUSTRALIAN postal history.